Watch your back! . . . How to spot and identify demons and other subversive spirits . . . And what to do next.Demons, fairies, and fallen angels are everywhere. They lurk at crossroads, crouch behind doors, hide in trees, slip into beds, wait in caves, hover at weddings and childbirths, disguise themselves as friends, relatives-even disguise themselves as you. They are powerful; they are protean; they are enchanting. And, to the uninformed, they are often invisible. This illustrated guide-the first of its kind-reveals the remarkable permutations of the demon and fairy species worldwide. 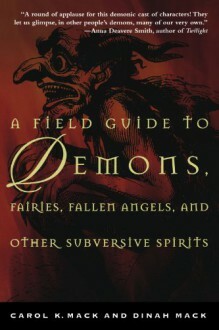 Packed with lore about each demon, detailing its origins, the culture surrounding it, and its reputed antics and exploits, A Field Guide to Demons, Fairies, Fallen Angels, and Other Subversive Spirits is a fascinating exploration of global mythologies. Perfect for the armchair traveler and the intrepid, seasoned demon-spotter alike, this complete guide to subversive spirits offers a behind-the-scenes look at the devilish mishaps, impish irritations, and demonic devastations that punctuate our lives. Highly readable, and also informative in trying to find some common themes in a profusion of stories from around the world (but not going overboard with interpretation).